Heat the olive oil into a tagine and fry the onion, garlic, the spice mix and salt and pepper. Stir for about 5 minutes and add the chickpeas, stock and tomatoes to it. Bring the mixture to a boil and simmer in low heat for 10 minutes. Throw in the beans, zucchini, and mix for 8 minutes. Cook the couscous in a bowl with hot water for about 5 minutes. 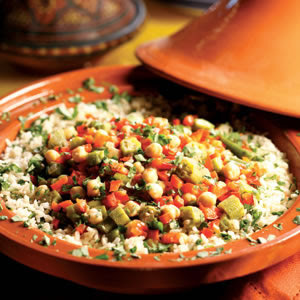 Make it fluffy and serve it with the tagine. Garnish with harissa on top.